Nicolas: I chose New Zealand because I saw a TV travel documentary about it. The scenery of the mountains, ocean and beaches all looked amazing, so had to see it for myself. 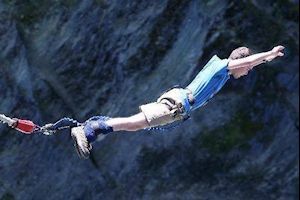 Plus, that’s when I learnt about bungy jumping in NZ and decided I have to try that! I’m also a Lord of the Rings fan so it was also a good reason to come to NZ and see the amazing landscapes from the movies. Why did you use our website? Nicolas: As this was going to be my first solo trip abroad, I wasn’t sure where to start my planning so I’m very glad I found your site. I was looking at various NZ travel companies and compared the multiple services to find the best value of all the travel companies. Nicolas: It was a very personal company and they answered all my questions and emails promptly, which I found very professional. They also helped start the planning process for my trip including assisting me with opening a New Zealand bank account even before I left so I knew I was in good hands. Nicolas: All the services are very useful. You get a transfer from Auckland airport to the hostel where you stay for three nights. That’s also where you meet your advisors and they give you lots of info about finding a job in New Zealand and a CV critique. They also help you get an IRD number and also get a bank card (both very useful and important if you’re plan on working in New Zealand). Plus, I got an entry ticket to the Skytower, which wass a nice bonus and a great way to see Auckland. 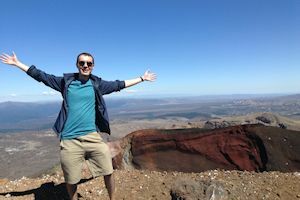 Nicolas: Having everything ready when I arrived in New Zealand was great and took away some of the stress of travelling alone to a new country. But, I think the best part is that the starter pack is good for one year so you can contact them anytime to talk or ask them anything, which I found very helpful. Nicolas: Yes, absolutely! The Stray hop on hop off bus was an awesome experience and a really good way to see all of New Zealand from north to south. The best part is that if you stop in a town that you like and want to stay longer, you just advise the driver. Then when you decide to leave, you call up Stray and hop on the next available bus to continue your journey. Plus, you make a lot of international friends on the bus and do some pretty cool activities along the way so it’s definitely worth it! Nicolas: There’s so many activities to do in New Zealand that it’s hard to pick just one! 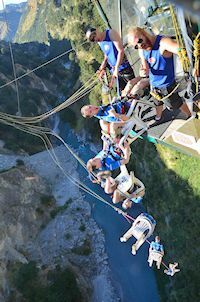 I think the one I’m most glad I did, as it was on my bucket list, was the doing the Shotover Canyon Swing in Queenstown. It was an amazing experience and an incredible adrenalin rush to fall 109m into the canyon below! Nicolas: My biggest challenge was probably finding a job in NZ. It was a long process and I sent out many CVs with few responses. It was a bit discouraging but I kept trying and finally found a job via a recruitment agency in Christchurch. Nicolas: First off, do it! It’s a great experience and New Zealand is great country to visit. But definitely come prepared and especially arrive with a good amount of money. Things (food, hostels, and activities) are expensive in New Zealand and so you can quickly spend your money. If you budget and plan what activities you want to do before you arrive it should help stretch your money longer. Also, if you’re looking for a job in a city, definitely go to multiple recruitment agencies and hand in your CV. If you’re open to any type of work, it should be pretty quick to find a job and start working. Nicolas: This was a great adventure for me and I learnt many things about New Zealand, but also about myself. I’m really glad I got to know more about this country including its culture, language and geography. New Zealanders are some of the friendliest people. I’ve made lots of international and Kiwi friends along the way, which I won’t soon forget. But I’ve also learnt to be more independent and become more resourceful when travelling which will be useful for my future trips! Nicolas: For sure! 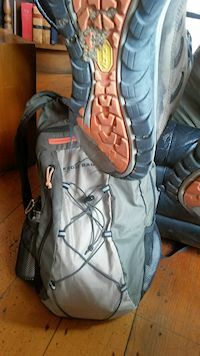 If anyone was thinking of doing a working holiday in New Zealand, I would definitely recommend finding a pack on your site.